Today, and for the past few months, I have been thinking a great deal about moral philosophy. I’ve observed my own convictions becoming unsteady, so I wanted to spend time considering — and articulating — what I fundamentally believe. What is the basis of right action? How do I define right action in my own case? How ought I comport myself? These thoughts bring me back to my old friend, the philosopher Immanuel Kant (1724-1804). His thinking revolutionized our approach to reason and morality. 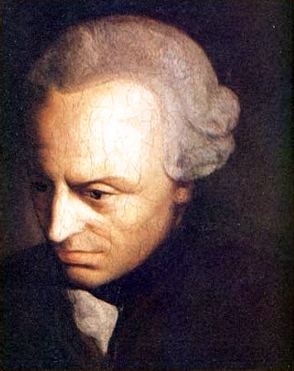 Kant’s thinking outlined a deontological ethics — meaning an ethics based on duty. An act is right not due to their particular consequences, but due to the motives of the actor. If there is a standard of behavior that I try to aspire to, it is encompassed in the second formulation above: Act as if people are ends in themselves, not simply means. In the modern world, this often shows up as treating others — especially strangers — with dignity. Look the homeless person in the eye and greet them. Thank the server at the food truck. Make eye contact with other drivers and apologize when you cut them off. When you consider what it really means to treat others as ends in themselves, it can become daunting. It means giving those around us the freedom to make decisions. It involves trusting others even when risky. I see the categorical imperative as something to strive for, something ideal to try to order my life around. I know I frequently fall short. But I try. Previous Previous post: New Issue Guide From National Issues Forums: What Should Go On The Internet?